Beginning in 2014, there was a flurry of activity as we came up to the 100th anniversary of the start of World War I. 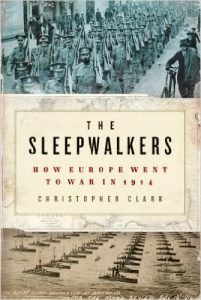 Poised to take advantage of the interest was the 2012 book The Sleepwalkers: How Europe Went to War in 2014, by Christopher Clark, the Regius Professor of History at the University of Cambridge. Prior to reading this book, most of my knowledge of the outbreak of World War 1 probably came from The Guns of August, Barbara Tuchman’s Pulitzer Prize winning book about the start of the war. Her book, which starts with a memorable scene of the funeral procession of King Edward VII, is mostly about the first month of the war (August 1914) with a brief part at the beginning about the diplomatic maneuvering and intrigues leading up to the war. And if I had to pick who was the focus of attention in this part of her book, I would have to say it was Kaiser Wilhelm II. Clark’s book is different. It ends with the mobilization of armies and spends its time with a deep dive into the history and diplomatic archives of the two countries whose dispute was the trigger point, Serbia and Austria. Just like Tuchman’s book, Clark’s book starts with a memorable scene involving the death of a monarch. In this case, it was June 11, 1903, when 28 officers of the Serbian Army invaded the royal palace in Belgrade, and shot and stabbed to death King Alexandar and Queen Draga, ending with them flinging the mutilated corpses out the window of the palace. With this as a backdrop, Clark then goes back and looks at the nationalistic tensions that developed in Serbia since its founding from a portion of the retreating Ottoman Empire. This included a multitude of plots and secret societies, all of which ultimately led up to Sarajevo in June, 1914. While Serbia thought that it should be the leader of all the South Slavic (Yugoslav) peoples, they were thwarted by the fact that the dual monarchy of Austria-Hungary actually ruled over part of what Serbia desired (including Bosnia, Croatia, and Slovenia). So the second part of the book looks at the slow disintegration of Austria-Hungary and its amazingly complex political system that tried to tamp down ethnic tensions from the parts of the empire that weren’t Austria and Hungary. Once the backstories of these two main players are established, he then works his way through the allies. On Serbia’s side, the Russian Empire backed them up as protectors of the Slavic people, with France allied with Russia (in what was primarily an anti-German alliance), and the slow shift of France and Great Britain to allies after centuries of being enemies. On the Austrian side was their fraternal alliance with Germany, with both empires growing out of the pieces of the Holy Roman Empire. But Russia, France, Great Britain, and Germany take up less of the book than the two instigators. The story this book tells is, by contrast, saturated with agency. The key decision-makers – kings, emperors, foreign ministers, ambassadors, military commanders and a host of lesser officials – walked towards danger in watchful, calculated steps. The outbreak of war was the culmination of chains of decisions made by political actors with conscious objectives, who were capable of a degree of self-reflection, acknowledged a range of options and formed the best judgements they could on the basis of the best information they had to hand. Nationalism, armaments, alliances and finance were all part of the story, but they can be made to carry real explanatory weight only if they can be seen to have shaped the decisions that – in combination – made war break out. (Kindle location 370). Bruce Kratofil is a market researcher, economist, and writer.